This is the time of the year for all things cookie. I really wanted to create a recipe for a cookie that had the salty sweet combo. I wanted something original and not something that we have all seen a million times. I wanted it to be in the traditional cookie shape and something that could be prepped quickly. I wanted the cookie to hold up well to being frozen but most importantly I wanted the cookie to taste good. 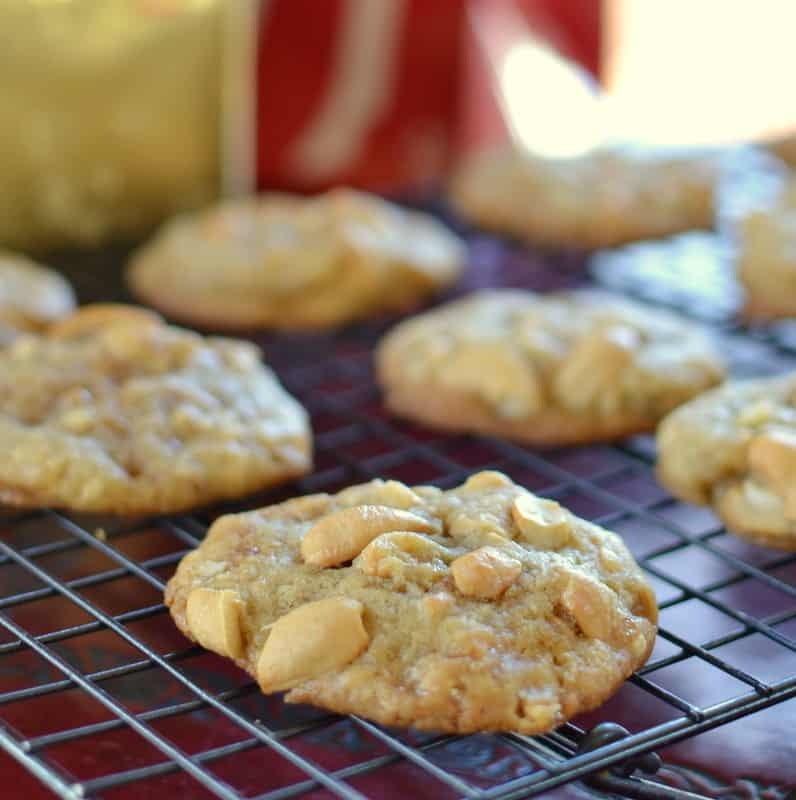 These Salty and Sweet Cashew Toffee Cookies fill all of those requests. 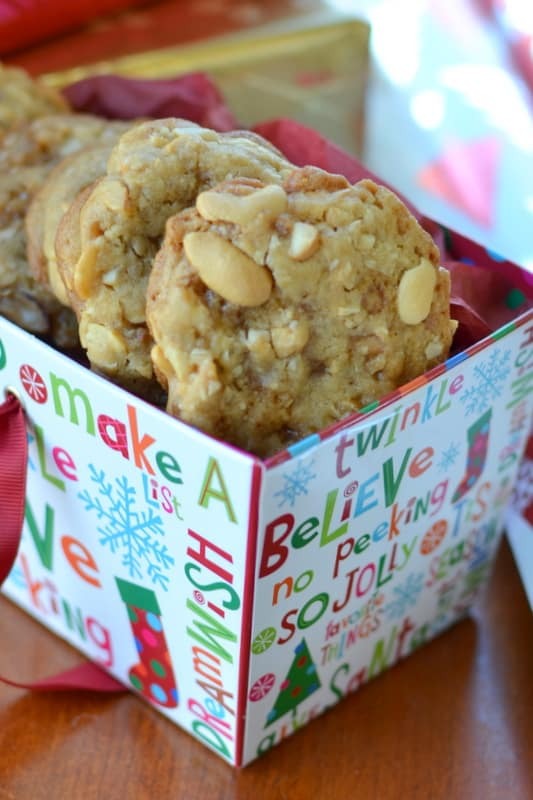 They are the perfect combination of salty and sweet in a scrumptious chewy cookie. What is your favorite holiday cookie? Are you a thumbprint fan? Do you prefer Jam Filled Shortbread Thumbprint Cookies , Peppermint Chocolate Thumbprint Cookies or Double Chocolate Cherry Cookies. Are you a chocolate chip cookie fan? Do you like the nice Thick Chocolate Chunk Pecan Cookies? There are so many cookies and so few days until Christmas. The dough needs to refrigerate for several hours as we tested through trial and error. They just seem to end up at the perfect height when the dough was stiff and cold. If you can’t work it with a cookie scoop then just roll it between the warmth of your hands. I like large chunks of cashews so I halved part of them and chopped part of them. If you don’t like large chunks than chop them all. 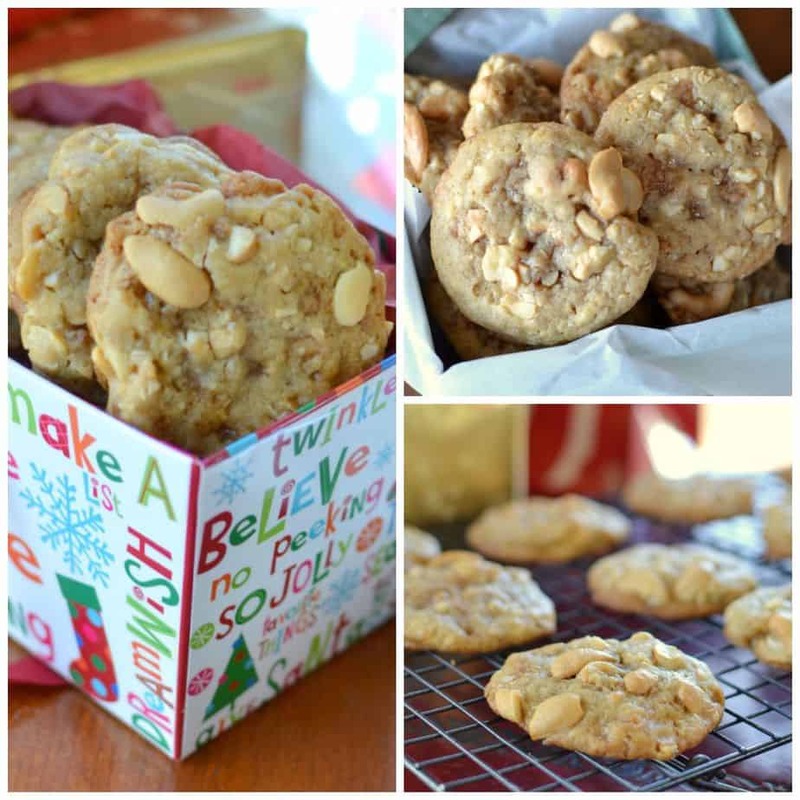 These Salty and Sweet Cashew Toffee Cookies can be frozen ahead of time. I pack all my cookies in doubled Ziploc freezer bags and place them in sturdy glad-ware containers. When defrosting take them out of the containers frozen and place on serving trays or platters uncovered. Never allow them to defrost in the plastic and the containers. The condensation that builds in there will ruin the cookies. So if you are looking for something a little different this year. 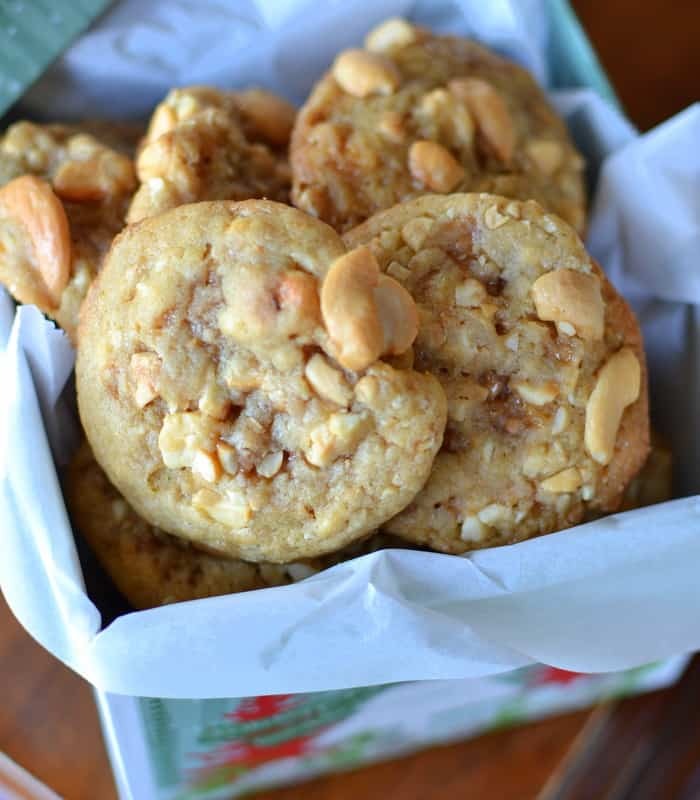 Something that is going to make their ears perk up and tantalize their taste buds than these Salty and Sweet Cashew Toffee Cookies are the cookie for you. In small bowl mix together flour, baking soda and salt. 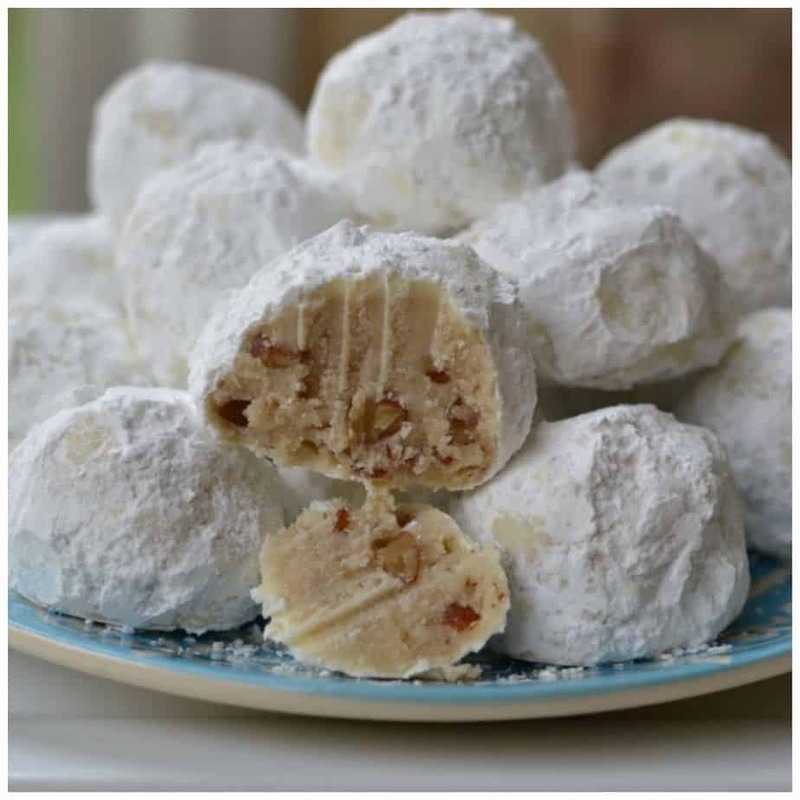 In stand mixer or using mixer cream butter and sugar until fluffy. Add in vanilla and egg and mix on low just until incorporated. Add dry ingredients to butter mixture in three parts mixing until combined; scraping the bowl and the beaters. Stir in toffee crumble and cashews. Cover and refrigerate for several hours up to overnight. Preheat oven to 350 degrees. Using 1 1/2 tablespoon cookie scoop place on cookie sheets a couple inches apart. Bake 13-14 minutes. Do not over bake. Cool on cookie sheets for 10 minutes before carefully placing on cookie cooling racks. If you don’t have a scoop just roll them in one inch balls and place on cookie sheets. Do not flatten. 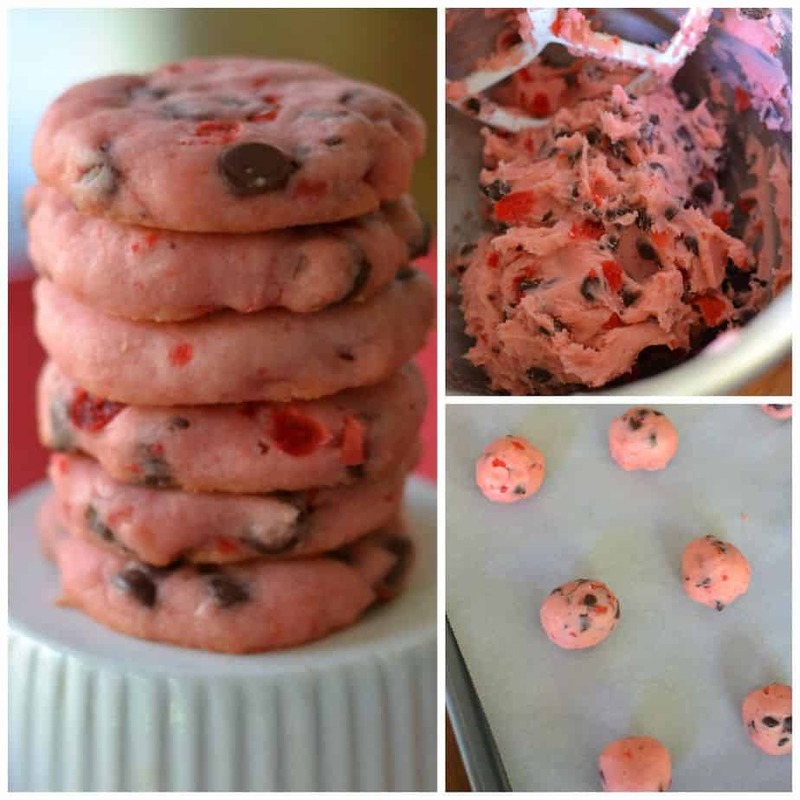 Other cookie recipes you will love! Can they be frozen after they have been baked? Yes they can. I love those cookies. I had to freeze mine so I would stop eating them. Happy baking. Thanks. I love them. They are delicious! Baking my cookies now, this will be this year’s surprise. Looks yummy! Awesome. I love those cookies. Thanks so much and happy baking! I bake them for my cookie swap party. And my family loves them especially my husband.